I washed my daughter’s favourite sweater dress twelve times in the past two weeks. I did it for you guys. I did it to test a theory. I did it for SCIENCE! You see, knitwear is the bane of my existence. Oh don’t get me wrong, I love a cozy sweater as much as the next gal. But, as a general rule, knitted things don’t wash up well. They ball up, wrinkle up, stretch out, and fray more than any other type of clothing. But then I had the most amazing light bulb moment the other day. 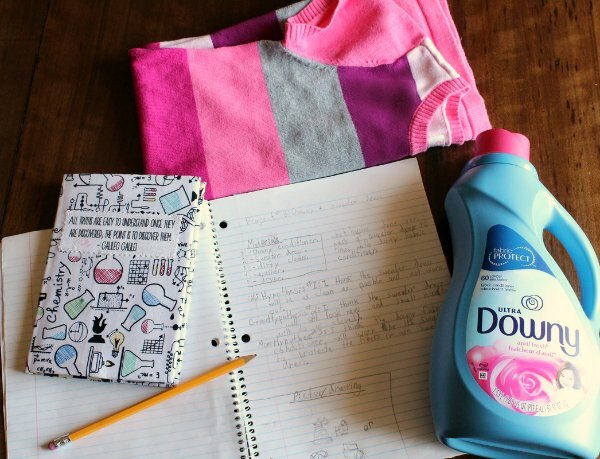 Downy approached me to ask about working with them on a sponsored post and they pointed out some neat facts about how Downy helps keep your knits looking and feeling their best. Like a conditioner protects hair after shampoo, Downy conditions to protect clothes at the fibre level from damage during the wash. You wouldn’t skip conditioner after you shampoo – same goes for your clothing. Ding. It’s like something snapped into place in my mind. Conditioner for your clothes. Of course. Dang. That makes so much sense. Wow. How have I never thought of this? I’ve never considered fabric softener as fabric conditioner. This could explain a lot as to why my sweaters never last! My hair gets all dry and frizzy during the cold dry winter months. It gets staticky. If I don’t use conditioner my hair is a mess of broken ends. It would make perfect sense for the same principles to apply to fibres, a.k.a. yarn, a.k.a. knitwear! 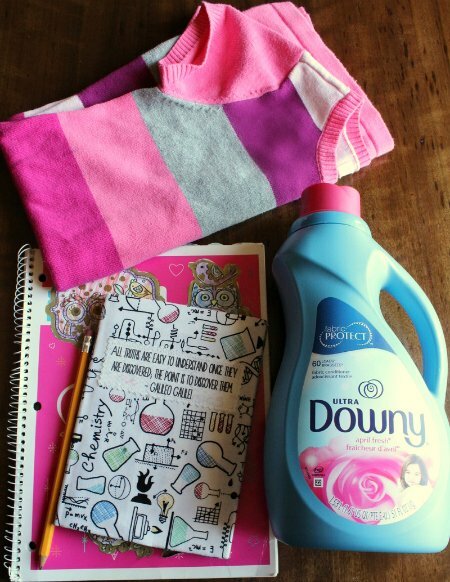 So I was really intrigued by the idea of using Downy as conditioner for your clothes. I wanted to test it out and give you guys a fair review of what my experiences were, but I was on a really short time frame. I didn’t have a few months to wear, wash and repeat. I had about nine days from when the bottle of Ultra Downy Liquid Fabric Conditioner arrived on my doorstep to when my post was due. Which is why I decided to sacrifice one of my daughter’s lovely knit dresses in the interest of science. Yeah, I went all scientific method here. See, my six year old is a little scientist in training. She and her big sister play “the science game” all the time. The six year old comes up with wacky science experiments and the nine year old helps her write it all down in her “Science Factory Book”. They have a format, which surprisingly doesn’t stray too far from actual scientific method: Project Name. Materials. Question. Hypothesis. Results. The problem is the nine year old caught me washing her sweater dress for the third time in two days and not thinking things through I casually said, “Oh, I’m just doing an experiment to test out this fabric conditioner.” My daughter gave me an odd look and dashed out of the room yelling, “Gigi, mom is doing SCIENCE WITHOUT YOU! !” That’s when I realized I had made a fatal error, I had let the word “experiment” slip out of my lips. Sigh. So that’s how my little trial run became an official “science experiment”. It became a family affair, with a dedicated page in Gigi’s “Science Factory Book”. Ultra Downy Liquid Fabric Conditioner, Tide Pods, one sweater dress, and other dirty laundry. What will happen if we wash Grace’s sweater dress twelve times? If we wash it using Ultra Downy Fabric Conditioner will it “condition” and protect her dress as advertised? Will the dress be in good shape when we are done? Downy Fabric Conditioner protects at the fibre level to reduce abrasion from daily wear, which ages your clothes. When fibres are conditioned, they’re protected against stretching, fading, and fuzzing. Downy Ultra will condition the fibers in this knit dress to help protect it from wear, so that after twelve times through the wash the dress will still be in good shape. We washed the sweater dress a dozen times. Every load of laundry I’ve done over the past nine days included two things, a capful of Ultra Downy and this sweater dress. Everything was washed in cold water, using Tide Original pods. I let the dress completely dry each time. I didn’t just wash it, and wash it and wash it again. I let it completely dry between loads (and my girl even wore it once or twice). After twelve times through the wash this sweater dress is still looking good. I should note that the dress was not brand new and was already starting to show signs of wear before we did this experiment. Ideally to test this out I should have used a brand new piece of clothing. I am also aware that if we were really doing a proper science experiment we would have a control. I have no way of knowing what would have happened if I washed this exact dress twelve times without Ultra Downy. However, past experience with washing my kids clothes tells me it would likely be looking pretty rough. So overall, even though this wasn’t a proper scientific experiment, I’m confident that Downy is what made the difference here, and that using Downy to “condition and protect clothes at the fibre level” does indeed work to help make knitwear last longer. Also my daughter noticed that after being washed twice with Downy her sweater dress was noticeably softer, or as she put it “less cruncherific”. Conditioner for your clothes. Yep. I’m sold. What about you folks? Does anyone else have science experiment obsessed little ones on their hands? Have you tried Downy? Do you use fabric conditioner, or like me (until now) is that a laundry step you normally skip? Disclosure: The post was sponsored by Downy. You should also know that I would never recommend a brand or product that I don’t genuinely love and use, and, as always, my words and opinions are my own. 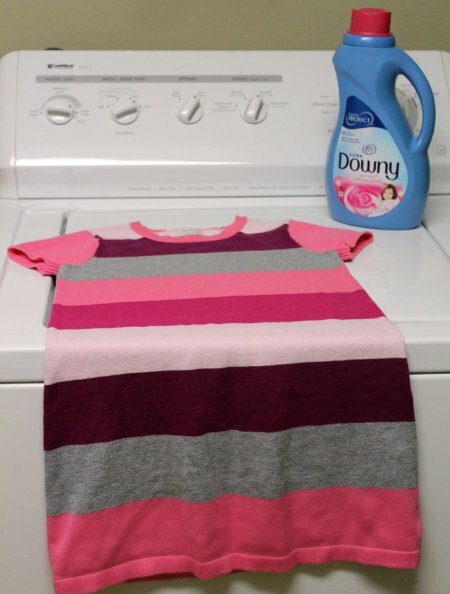 I used to buy the cheapest brand of laundry detergent and softener, but I found my clothes were not getting cleaned or were not nice and soft, since I have been spending the extra money on downy, my clothes are coming out soft and static free and smell so nice, it pays to spend a little extra on the good stuff!! Downy really helps and I have hand wash on my machine! Ohh, I’m jealous. I wish my machine had a handwash setting! I don’t use Downy but I think you convinced me to give it a try! What a lovely fun post this was to read. So glad you could help out your daughters with a science experiment. 🙂 I wish that I had a hand wash cycle on my machine, I only have delicates so it’s all washing by hand 🙁 I think that I might have to try out the Downy, though I do use a special wool fabric conditioner, Downy might be better. Thank you for this. I must remember to always use Downey for my clothes. Sometimes I do forget. 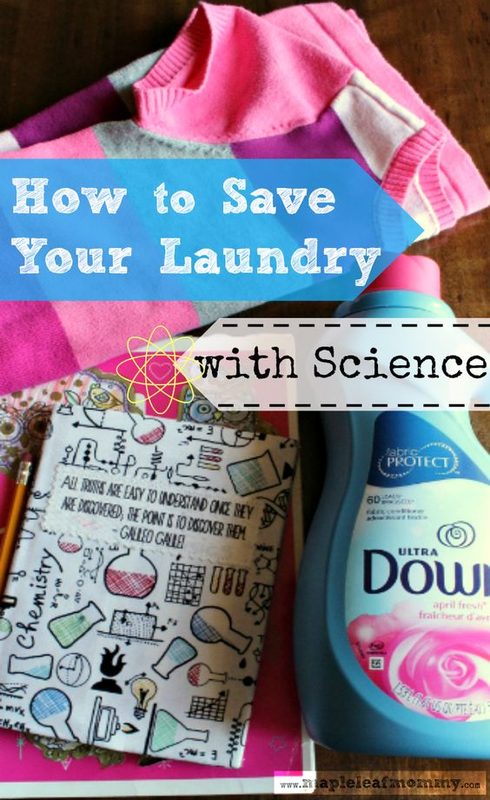 I don’t generally use a fabric softener but your post may have convinced me to give it a try! I found out that cheap detergent never got the clothes clean enough. The Science Factory Book sounds so cool! How great that your kids are so keen to learn and explore!!! I love this experiment that you did. I live in sweaters during the winter so I could definitely use the Downy conditioner. Crinkly hard sweaters are the worst! I will take your word for it! I’ve always loved Downy but have stopped using it for some reason… but I’m sold. It will help me take better care of our clothes.